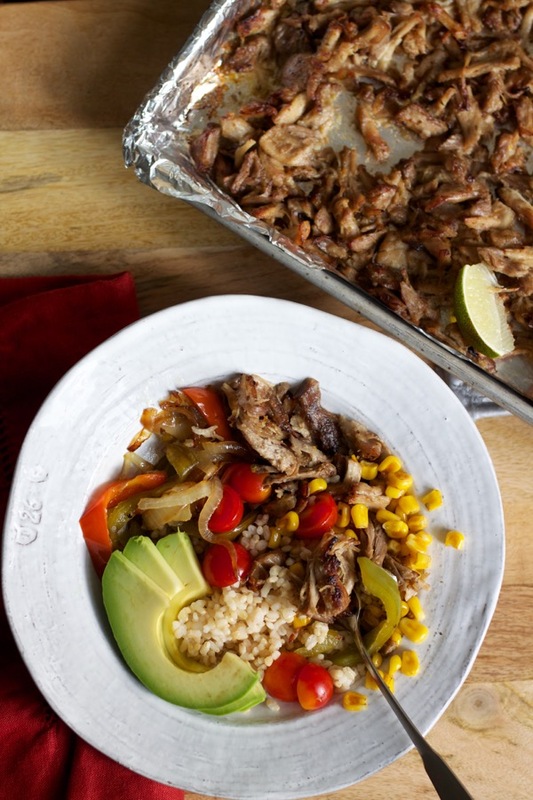 If you read Part 1, then you know that crispy, rich, tasty pork carnitas are a key component to The Ultimate Crowd-Pleasing, Make-Ahead, Freezer-Friendly Party Meal. This post is devoted to the rest of it – the elements that make a meal that can satisfy just about anyone’s tastes and dietary preferences. You are channeling Chipotle, and you’re going to make a lot of tummies very happy. That’s gonna be a good burrito bowl! 1. The Rice. I always use brown rice…because I like it, and it’s good for you. And I always cook it in the oven. 2. The Fajita Veggies. I like a ratio of one really big onion to two medium bell peppers – preferably different colors to keep things exciting. Heat up a little oil in a big skillet, and start the onions first for a couple minutes. Add a little salt and pepper and the peppers, and continue to cook until the veggies are crisp-tender (or longer if you like them a little more well-done!). For a more hands-off approach, you can also easily roast them in the oven. 3. The Beans. I typically use black beans, but pinto beans are good, too. I’d like to explore the world of cooking dry beans, but in this situation I open a can and drain off just a little of the liquid. They get heated up in a pot with some dashes of ground cumin, chili powder, and garlic powder. 4. The Crispy Corn. I always think about skipping the crispy corn, but then at the last minute decide to make it! Heat up a little oil in a skillet, add frozen corn and salt, and stir around for several minutes until it begins to caramelize. Yum. You could also just warm up corn in the microwave, or serve a corn salsa option! 5. The Garnishes. Lettuce (chop up a bunch in case some people want to make a salad rather than a rice bowl), shredded cheese, salsa, sour cream, guacamole or chopped avocado, lime wedges, cilantro…self-explanatory, yes? 6. The Tortilla Option. 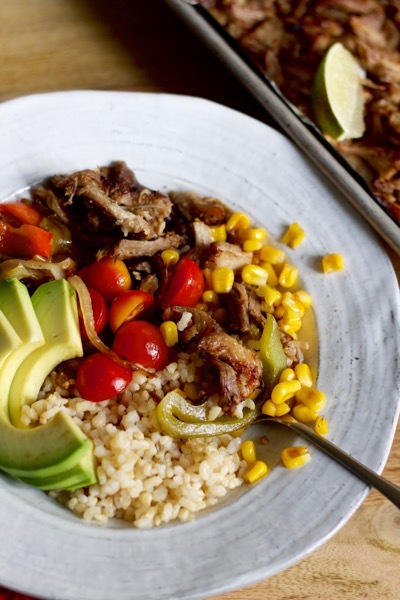 We’ve eaten the carnitas as soft tacos and burritos before, but I love the rice bowl format since for me, the tortilla kind of masks some of the crispy perfection of the carnitas. But I like to offer them if we’re feeding a crowd, especially one with kids. …this is The Ultimate Crowd-Pleasing Make-Ahead Freezer-Friendly Party Meal! Yum. I happily partook of the pictured burrito bowls! So very delicious!! I’m ready to “help” with the next meal photo shoot! Yum!! Are you loving that pot?? I use mine at least once a week!! Bet – that pork is the most amazing yumminess EVER! I will be cooking this regularly.